A garuda (pronounced gah-ROO-dah) is a creature of Buddhist mythology that combines the features of humans and birds. The garuda first appeared in Hindu mythology, where it is a singular being—Garuda, son of the sage Kashyap and his second wife, Vinata. The child was born with the head, beak, wings and talons of an eagle but the arms, legs and torso of a human. He also proved to be strong and fearless, especially against evildoers. In the great Hindu epic poem The Mahabharata, Vinata had a great rivalry with her older sister and co-wife, Kudru. Kudru was the mother of the nagas, snake-like beings who also appear in Buddhist art and scripture. After losing a wager to Kudru, Vinata became Kudru's slave. To free his mother, Garuda agreed to provide the nagas—who were treacherous creatures in the Hindu myth—with a pot of Amrita, divine nectar. Drinking Amrita makes one immortal. To achieve this quest Garuda overcame many obstacles and defeated several gods in battle. Vishnu was impressed with Garuda and granted him immortality. Garuda in turn agreed to be a vehicle for Vishnu and carry him through the skies. Returning to the nagas, Garuda achieved his mother's freedom, but he took the Amrita away before the nagas could drink it. In Buddhism, garudas are not a single being but more like a mythical species. Their wingspan is said to be many miles wide; when they flap their wings they cause hurricane-force winds. The garudas waged a long-standing war with the nagas, which in most of Buddhism are much nicer than they are in the Mahabharata. In the Maha-samaya Sutta of the Pali Sutta-pitaka (Digha Nikaya 20), the Buddha makes peace between nagas and garudas. After the Buddha protected nagas from a garuda attack, both nagas and garudas took refuge in him. Garudas are common subjects of Buddhist and folk art throughout Asia. Statues of garudas often "protect" temples. The Dhyani Buddha Amoghasiddhi sometimes is pictured riding a garuda. Garudas were charged with protecting Mount Meru. 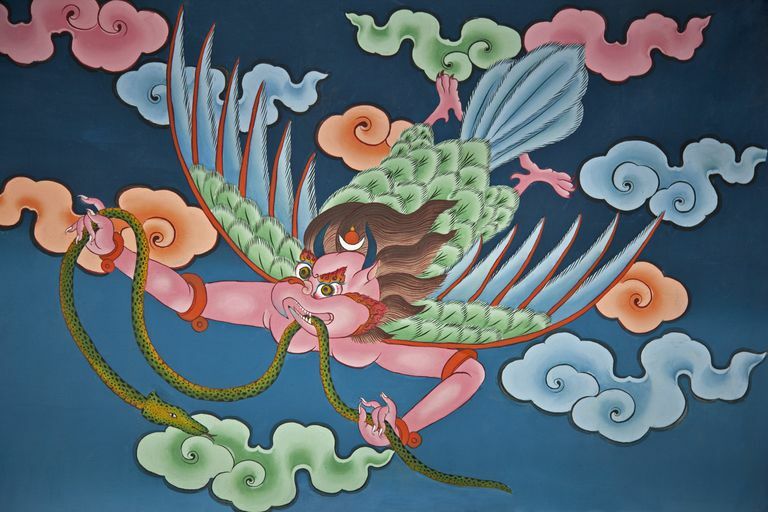 In Tibetan Buddhism, the garuda is one of the Four Dignities—animals that represent characteristics of a bodhisattva. The four animals are the dragon representing power, the tiger representing confidence, the snow lion representing fearlessness, and the garuda representing wisdom. Originally very birdlike, in Hindu art garudas evolved to look more human over the centuries. Just so, garudas in Nepal are often depicted as humans with wings. However, in most of the rest of Asia, garudas maintain their bird's heads, beaks, and talons. Indonesian garudas are especially colorful and are depicted with big teeth or tusks. Garudas also are a popular subject of tattoo art. The garuda is the national symbol of Thailand and Indonesia. The Indonesian national airline is Garuda Indonesia. In many parts of Asia, the garuda also is associated with the military, and many elite and special forces units have "garuda" in their name. Who Was Henry Steel Olcott in Buddhism?